Discussion in 'Developer Diaries' started by Sno-dog, Feb 16, 2018. Hey everyone! Sno here with a new level to share with you all that will be coming to MB2 in the next few weeks! First off, a little history. Dxun began development by a team member named Droidee roughly 7 years ago. 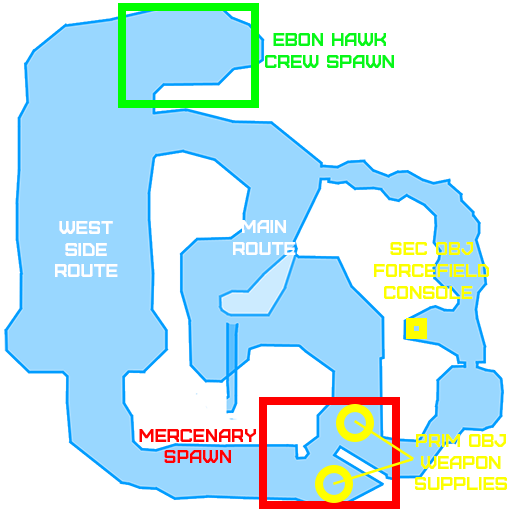 Droidee managed to complete most of the map from the beginning. The framework and terrain were all setup and Mace had started working on the vis a bit. Though when I joined the team I ended up picking up this project mid-way, which was about 5-6 years ago. Something had come up and Droidee was unable to continue development. Credit goes to him for a large portion of this project. Anyhow, I started working on Dxun and over the course of a year I managed to add in the objective, add in the East Side Route and the underground route, fill up the map with some models, reorganize some terrain for vis optimization, and generally polish the level a bit. Life hit me at this point, which was probably about 5 years ago, and I was inactive ever since. Fast forward to the beginning of this year and I have resurfaced in order to continue helping this amazing fan project and to finish what I had started. As you can tell Dxun has been in development for a long, long time. And I'm excited to finally be able to show you all, so let's get into it! Dxun is a level inspired by Knights of the Old Republic II (KOTOR II). Fans of the series will probalby recognize the name Dxun. I'm not going to go into detail about what happens on Dxun in KOTOR II, but I will say the objective and the level design all pull inspiration from the events and visuals presented in KOTOR II. In order to gain favor with Mandalore, the Ebon Hawk Crew must take out a nearby supply of Mercenary weapons. The weapon supplies are providing the Mercenaries with enough firepower to fight back against the Mandalorians. By destroying their weapon caches, Mandalore will be able to gain greater control of the jungles and will owe the Ebon Hawk Crew a great debt. It won't be easy though, the caches of weapons are protected by powerful forcefields that must be taken down by hacking into the Mercenary's security systems. Once the forcefields are down, the weapon caches can be destroyed by all types of weaponry. The forcefields must be hacked to be taken down. There are two locations where they can be hacked. One of the hacking locations is below in the Mercenary Spawn area. Once the forcefields have been hacked they will shut off, revealing the destructible weapon caches. The weapon caches must then be destroyed by any means necessary (even punching works). Dxun has a lot of vertical gameplay elements. It is a large outdoor map with a cyclical design layout. I'm excited to hear your feedback and to play it with you all in the next few weeks! And of course: this level is still being polished up. Please understand that some visual changes (minor or not) may occur! Gargos, Manyo, Onysfx and 28 others like this. this is amazing! you're amazing! oh shettt what the fukkkkk i want to like this eight times, it looks aesthetically rad and the circular design and verticality are both Very Intriguing and i love having more KOTOR/KOTOR2 content, curious about how the FA classes will be too. - The actual KOTOR 2 scenario that this is derived from IIRC is just a little waltz through some woodland creatures and maybe some overly-defensive old construction robots, to raid a more-or-less undefended cache. It's kind of a weird scenario to turn into a Big Good Guys Vs Bad Guys War, but this is just a tiny worthless observation by me. What's more important is it's a neato map. Well I can confirm some of them are pretty interesting and fun at least. I had a little bit too much fun on one of the classes in the last session. Luna, *Rhiannon*, Hessu and 1 other person like this. LOL had just finished doing it myself. Can there be too many vibroblades? President Bossk, Garblargh and Lessen like this. More than one if I am remembering correctly. Also, for some reason it reminds me about Unreal Tournament 2004. President Bossk and Luna like this. Oh, another outdoor map, just what we needed. Or not pit of death, and more pit of splash.